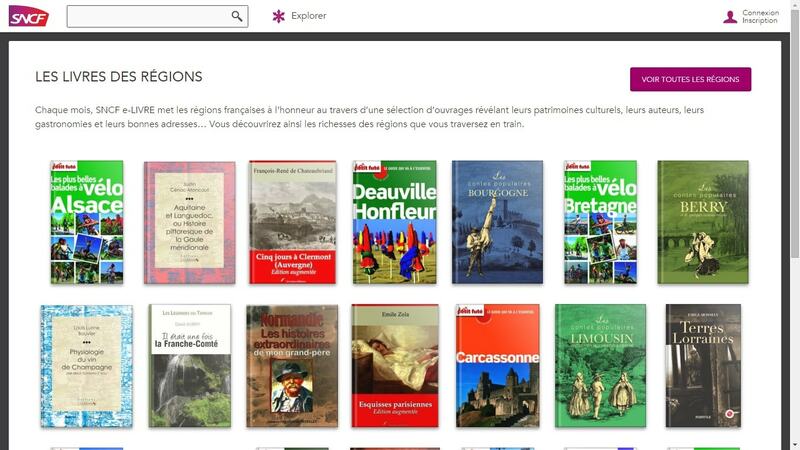 In September of last year the French Railway SNCF launched a free digital library where passengers could read short public domain works with reading times ranging from 15 minutes to an hour long. Evidently pleased with that program, SNCF expanded the program last week with the launch of a paid service that offers access to a catalog of 100,000 titles - and they're taking a leaf from Amazon's play book when they do so. The paid SNCF e-LIVRE service costs 10 euros per month, and lets subscribers download and read ebooks on their smartphones and tablets. The service will be free until mid-December (for the first 45 days) after which subscribers will be billed monthly. It is a freemium service; it still offers the 5,000 public domain titles and excerpts for free, but it also offers a catalog of 100,000 titles which includes best-selling novelists like Marc Levy, Amélie Nothomb, and Guillaume Musso. SNCF will also run a book of the month promotion and promote books which could help a reader discover a region's heritage and history, its stories and legends, and its authors. Selection is limited, however, because publishers are reportedly put off by the funding model. According to eFigaro.fr, SNCF e-LIVRE will pay publishers 65% of its revenues, and divide the payments based on the number of pages read. That, folks, is more or less the same model that Amazon adopted for Kindle Unlimited in July 2015, only with a more explicit split and a more specific cap on funding. Kindle Unlimited, on the other hand, is funded based on Amazon's arcane calculations. According to Amazon, the KU funding pool will total $12 million in November 2015. While some have complained that Amazon was paying indie authors less than trad publishers (even though this isn't strictly true), in SNCF e-LIVRE we have service that competes with Kindle Unlimited and uses the same model. And that makes perfect sense. What with Scribd cutting back its service, and Oyster selling out to Google, it's clear that paying the wholesale price for a book each time it is borrowed is simply not a workable idea. The Kindle Unlimited model is clearly the future of the subscription ebook market (assuming, that is, that this market has a future at all). People tend to forget these are rentals, not sales. Nobody pays full freight for rentals. Look to DVD rentals or digital movie rentals online. Those typical run from 5-20% of *discounted* sale prices. KU percentages seem to run better than 50% of sales revenue for full reads of most of their novels. Even for the higher priced titles in KU, the payout for full reads tends to run above 15%. It seems like a sustainable model. I see the similarity in the payout for authors/publishers. But SNCF does little else to “validate” Kindle Unlimited. The SNCF experiment takes advantage of several positives within the subscription model that Kindle Unlimited does not have available to it. Things like, niche, locality, shared activity, etc. SNCF does not need to have an exhaustive library. They can focus on regional and local interest books. Their customers share a very specific aspect of lifestyle–riding the railway. For a community that shares certain commonalities, I believe subscription has proven itself over the years (Harlequin, Mystery readers, etc.). The large KU model that requires an exhaustive library is quite a different beast. As other companies have discovered, banking on most of your subscribers to pay for unlimited books and then read little to nothing, is not only bad for reading, it is bad for business.